The BHS Battery Service Stand (BSS) is constructed with heavy-duty steel and provides a convenient place to temporarily store an industrial battery during lift truck service. The BSS is also ideal for storing a Drop-In Roller while not in use. The BSS provides 360 degrees of access to a battery, making it perfect for spot cleaning or troubleshooting. 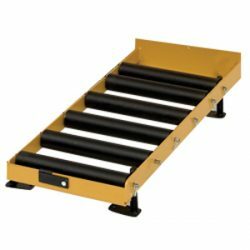 This simple but rugged stand features spark-proof, poly-sleeved rollers which reduce buildup of corrosive material and extend the life of the stand. Choose from a variety of roller heights and compartment widths to seamlessly match your lift truck fleet’s specifications. Custom models are available to meet your unique demands. Invest in a convenient, heavy-duty Battery Service Stand from BHS, and enjoy the benefits of 360-degree access to your lift truck batteries. Contact our sales team at +1 314 423 2075 to learn more about Battery and Charger Stands or to find a local dealer.